Coincidentally, we live in a time where a lot of online users are also content creators, and more specifically, video creators (or at least are video engagers and enthusiasts). We are a species that thrives on visual communication after all, so that makes sense. And with social media, our need to consume and create movie content is reaching new apexes. Consider some recent statistics in regards to Facebook video. According to Mediakix, "given the assumption of linear growth, if Facebook Video’s current daily views are around 32 billion per day, Facebook would be generating over 3,000 years' worth of watch time every day if every view was only about 3 seconds." 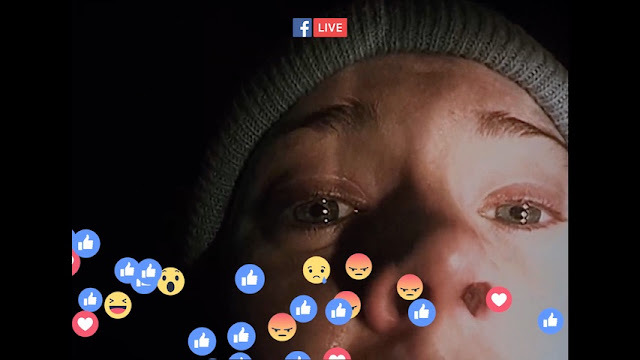 In addition, Livestream confirms that "78% of online audiences are already watching video on Facebook Live." In short, the image-making process has been democratized to the point where audience engagement is exponentially more important to the visual stories we are sharing with each other. As theatres continue to die, I don't doubt that we'll soon see films that are exclusively broadcast using live video platforms like Facebook. Which then had me circling back to Blair Witch. Can you imagine how the connotation of that film might perform under the scrutiny of an instant-gratification audience? Luckily you don't have to imagine it. I made that video for you.